I'm up to 5 lace repeats and I seriously love this pattern - it's so pretty! I know it's hard to see, but just take my word for it. Gotta love photographing details on black yarn. That's it for me this week :) I'll be posting some finished items soon too. 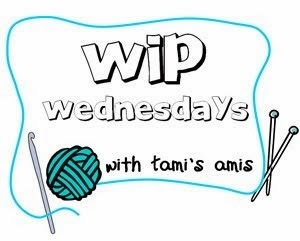 Head over to Tami's Amis' Blog to see what others are working on.